Hello everyone. It's the designated day, so here I am once again to provide an update on Quest Unlimited's progress. I left off last week talking about my plans for this week and I'm happy to say that I've been successful in following through on those and more. One of my mentioned goals was to implement a means of actually using the health potions that were dropping during questing. This is currently in place and working as expected. 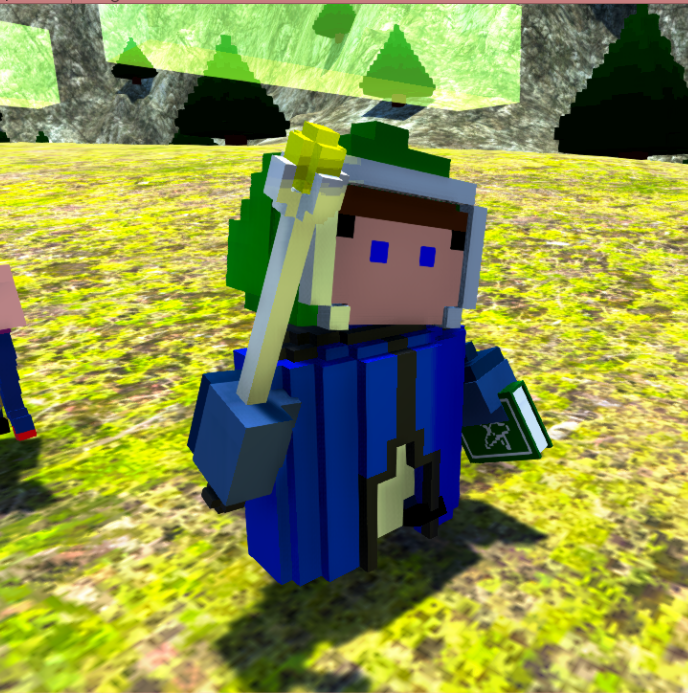 I even created a simple particle effect that triggers on a party member whenever they use a health potion. Next on the list was working on automating camera movement. Players now have the option to have the camera automatically follow a party member or to control the camera manually. The functionality is easily toggled on and off via the UI. There's also an indicator making it obvious which character that you're currently following. These next improvements weren't on my official list but I decided to work on them anyway. First off, we now have real-time lighting effects. Party members cast shadows, the campfires actually flicker with light and the whole map gets lighter and darker in accordance to the day cycle. I also spent some time working in Unity's Post Processing Stack improving the overall look of the game. OK, so we lost the fight to the orcs, apparently I might have a little balancing to do still. That's simple to fix at least. Slowly but surely the game is chugging along and making progress. I can't wait until there's more classes and class skills in the mix. I hope you all enjoyed the update. This is it for now but I'll be back next week with more, stay tuned. I have something to ready to show now, so I figured why wait until until the weekend as usual? So far I've created the models for several scepter parts so that they can be randomly configured in game, much the same as what I did for the swords and bows. Being as I had to take pictures of all the possible combinations for inventory icons, I ended up with 10,368 different sprites. I thought, what better way to show that off than an animated GIF looping through them all? So without further delay, here is a roughly 10.5 minute long GIF! The scepter will be he main-hand weapon of the upcoming wizard class. I still have to work on getting the other equipment ready before I start work in earnest on the class itself, but hopefully I'll have more of that to showoff this weekend. That about sums up this week's progress. Hopefully before long we'll be seeing the final class joining in on the fun. See you all next week, same quest day, same quest forum! Greetings everyone. Let me start this off by apologizing to any followers for the long delay in updates to this DevLog. Since the last update many delays took place that largely couldn't be avoided. There's honestly not all that much to show in terms of progress at the moment. The more recent work I've done has either born no fruit or is still in the process of being implemented. For example, I've spent countless hours tinkering trying to get a webGL build functioning properly with no success. 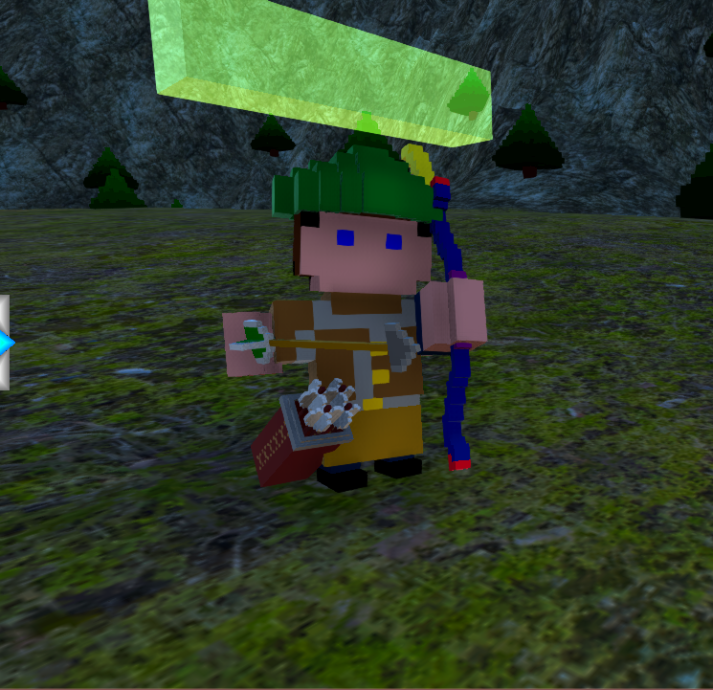 I've also spent quite a lot of time creating voxel assets for offhand items as well as the last class's weapon. The only visible progress is the implementation of shields (fighter and cleric offhand items). Thankfully those were implemented without much headache at all. I expect the same to be true of the other offhand items once their models are complete. Hopefully by this time next week I'll have all the offhand items implemented as well as the cleric class to showoff. Clerics were faster to implement than all the other classes because I decided to go the more traditional D&D route and have them wear heavier armor as opposed to the more MMO trend of having them wear cloth. This meant they could wear the same armor as fighters but with different stat desires. Unfortunately, this has made the clerics and fighters a little hard to distinguish from one another. The only visual indication being that clerics use maces while fighters have swords. Functionally I'm happy with how it worked out, but I'm going to need to put some thought into how to make the clerics more distinguishable from the fighters. That's all the progress to show for this week. I'm honestly not sure what will be the focus for this upcoming week. The skills system still needs to be implemented so that's a contender. I've also been wanting to work on a proper threat system for a long time now. So those are the top two candidates at the moment but something else might happen, who knows? I'll guess you'll just have to come back next weekend and find out! The fighter let's out a battlecry and all enemies within the expanding bubble receive a substantial amount of threat directed at the fighter allowing him to effectively tank multiple enemies. 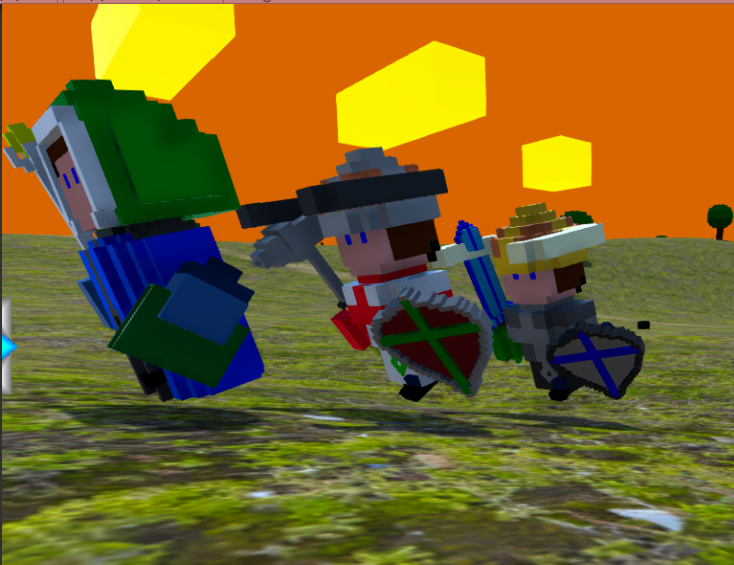 When I get more skills implemented I'll be posting a gameplay video of them all in action. I think the sounds really add a lot to the experience. Well that's all the game news for this week. This upcoming week will almost certainly be spent implementing new class abilities . Hopefully I'll have enough time to give them some proper polish. If not, there's always the following week. Until then, take care fellow questers! It's update time again everybody! I know you're all super excited but simmer down now while I elaborate on this week's progress. As I stated in the last update, this week was to be spent implementing new skills. I am happy to announce that all of our party classes now have a unique skill. I'll go over each of them now class by class. The fighter's battleroar skill made it's debut last week with the introduction of the skills system. It's an AOE ability that generate extreme amount of threat to all enemies hit by it. The cleric's heal spell (kind of obvious what his skill had to be) replenishes a significant amount of health to the spell's target. The hunter's new multi-shot ability shoots an arrow at every enemy in range. The wizards new enbigify(en-big-if-eye) ability causes him to become enormous and double his damage while active. You may also notice that this week's GIF isn't as saturated as previous ones. That's a result of my re-tinkering with post effects because I felt it was simply TOO saturated. I've yet to find a happy balance so I'm sure things will look different again in the future. So what's on the horizon? Currently all skills are working but totally ignoring mana costs. That's because a system to handle mana and it's use simply hasn't been worked on yet. So that's the target of this week's efforts. Hopefully soon all classes will have a mana bar with mana costs associated with their skill's use. Since that won't be overly exciting to talk about, I decided that next week I'll create a video showing all the effects in action and going into a bit more detail about them. Normally I try to get these updates up and out of the way Saturday mornings so I can take a day off. This Saturday came rolling around and I still hadn't implemented mana into the game yet. I decided that I really wanted to get that in and working before I posted this update today since I listed as something coming in last week's post. So this post is slightly later than normal (but it's still Saturday at least) but at least it has more goodies. As I mentioned, I spent today working on the mana system. That means updating the UI to hold mana (and health) information as well as interface that with working code to add functionality. I had to create functions to control all of mana's aspects as well as assign mana costs to all skills. Of course skills now have to have the requisite mana in order to actually be cast now. Costs will have to be tweaked I suspect, but that's simply a matter of running tests and finding what feels right. Nothing too technical there. I know I've been talking about putting a video together for a while now, but I really thought it was more important to spend today implementing what I promised as opposed to messing around video editing. It's still going to happen at some point! As for this upcoming week, I'm hoping to focus on a few simple things that have gone without love for too long. It'd be nice if completing quests actually gave you a reward of some kind right? So that'll be one of the things to get some time, it'd also be nice if we actually walked to the merchant to sell things instead of doing that wherever. The same goes for the town elder and receiving quests. I'm sure I'll sneak in something more but I haven't decided on what yet. Well that about does it for now, I'll see you all here again next week. It's update time! Hello everyone and welcome back to this DevLog. It's been a bit of a hectic week and I'm just going to dive right into the changes. First off, Quests Unlimited has been updated to Unity 2017. That was quite an ordeal to say the least. With that update taking place, I'm finally able to utilize asset bundles again! I ran into all sorts of strange bugs with the asset bundling systems but luckily I was able to fix them after many MANY hours of troubleshooting. I'll spare you all the details. Furthermore, as I alluded to my in previous post, party members now have to actually travel to the village elder and the merchant to receive/complete quests and sell loot. Luckily this wasn't all that hard to get working it just ate up a fair bit of time in testing. That's right, I finally made the video I've been promising since forever, OMG! The video shows what a single quest cycle currently looks like in game. We also get to hear all the sound effects you've been missing from footage in GIF form. Obviously there's always room for improvement (still need to add an arrow collision effect for multishot among other things) but I think everything is looking a lot better than it once was. With all that said and done, you might be wondering "what's next?" Well, I'm thinking it might be time to start working on an equipment upgrade system. We need something to spend all this lovely gold on right? Speaking of which, I've been thinking It'd be nice if we could actually buy potions at the merchant. I'm honestly not sure how much I'll actually get done before the next update though. Depends on how smoothly things go. And with that thought, I'll bid you all farewell until next time. The number of times an item can be upgraded is determined by the item's level. Since these items are level 1 items they max out with 1/1 upgrades (as indicated on the bottom left of the equipment upgrade window). So a level 5 item can be upgraded 5 times, a level 10 item upgraded 10 times, etc. The cost of upgrading an item scales by the amount of times it's been upgraded getting MUCH higher the more it's upgraded. This in conjunction with setting a maximum number of upgrades ensures that you will still be replacing gear even after it's been upgraded, it just might take longer to be worthwhile. Meanwhile increasing specific stats increases the equipment's effectiveness. With the upgrade system out of the way I'm hoping this upcoming week to implement purchasing potions from the merchant. I'm thinking maybe some sort of buyorder system. For example, you set your party to automatically buy potions when at the shop if under a designated threshold. Something along those lines. Anyhow, I appreciate everyone who's taken the time to actually read these posts. I hope you like what you're seeing so far. 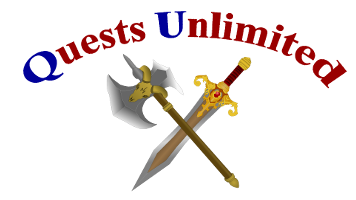 It's time again for the weekly update telling everyone about Quests Unlimited's progress. The weeks keep flying by and it seems there's just never enough time to tackle all the things I'd like to. Luckily this week I was able to complete one system I had spoken about doing and another I decided to implement on a whim. First off, let's talk about the auto restock ability I've implemented this week. It's rather simple in concept, you can designate how many of each potion you'd like to have before embarking on each quest. When you visit the merchant you'll automatically purchase the amount of potions required to get you to the designated restock amount. This is assuming you have the requisite gold of course, you're not getting them for free! As for what's to come this next week, I'm not entirely sure. Being as this game is unfunded(therefor I am unfunded), work on the game this upcoming week will be meager as I need to do some paying work to get food in the pantry, etc. I've been thinking it'd be nice to have a title screen for a while now, so maybe I'll throw one together this week. As for what else if anything will be accomplished, I honestly couldn't say. Anyhow, that's all for this week's update. I hope to see you all here next week! Welcome back to the devlog everyone, this week was a bit more productive than I anticipated. I decided it would be fun to add another enemy to the lineup this time around. Then I spent this rest of the week bug crushing to bring the game closer to release status. Being high damage with low health, they tend to grab aggro and die fairly quickly as things are at the moment. That's just how the threat mechanics work. Once I get into enemy abilities, skeleton warriors will almost certainly get a skill similar to the fighter's aoe threat ability that allows them to tank more effectively. This will allow skeleton archers to live a lot longer while putting out tons of damage. So that's all for this week, but what's to come? Well, right now I'm thinking that perhaps I'll go ahead and add more enemy classes to the mix. I want at least three enemy types for each combat area and right now with the exception of the graveyard with two enemy types, all zones only have 1 currently implemented. So if I could add another enemy for the forest and cave zones I'd be happy for now. But who can say for sure, I'm changing my plans up quite often, so you'll just have to come back and read next week's post to know for sure! Thank you everyone for your continued interest and I'll see you next week. I'm back with yet another update! Last week I mentioned adding more enemy classes and that's been my focus this week. The forest and cave zones now each have another enemy class for our heroes to overcome. The first enemy we'll talk about is the new ogre enemy which spawns in the forest location. Let's have a look at this bad boy! The ogre is a MASSIVE tanky enemy with an aoe spin that does damage to all party members in range. This spin also generates extra threat helping him hold aggro for his companions. That's right, it's a goblin suicide bomber! This little guy targets the closest party member and explodes dealing significant aoe damage based on each party member's distance from the explosion. So that brings us up to 2 enemies per zone now. Having a bit more variety sure is nice. On a minor note, the skeleton warrior's ability has also been implemented although it's not as flashy as others. I'm still contemplating what kind of particle effects if any might be appropriate for it. Anyhow, the functionality is simple, they emit a frightening aura passively generating threat with all party members while in combat. That should wrap up the tank stereotypes in the game so the next 3 enemy classes should have more interesting abilities to use against us. That about wraps it up for this week's DevLog update. Have any questions/comments? I'd love to hear back from you all. Until next week, happy travels. Hello and welcome back everyone. I know it's been a while since I've updated this devlog but I've finally returned to share the recent developments. This week we see the debut of the 3 zone bosses! These enemies are much stronger and obviously much larger than the normal enemies. They're actually always 5 levels higher than our group with considerable stats. On the bonus side of that, being 5 levels higher means they drop gear 5 levels higher than what our party normally has access to. Currently they have a 100% chance to drop a random item as opposed to the more meager drop rate of other enemies. They also drop gold unlike anything else in the game! Currently they have roughly a 5% chance to spawn although this number may be tweaked later on for gameplay balancing. So let's take a look at these behemoths! This demonic monstrosity is the overseer of the graveyard zone. This towering troll is the king of the forest. This mighty orc is the chieftain of the caves. That's all I have to show for this week. Hope to see you all again next week! I'm back with a smaller (and later) update this week. I've been working on the save/load system and I'm happy to report that the core mechanics of the system are currently operational. 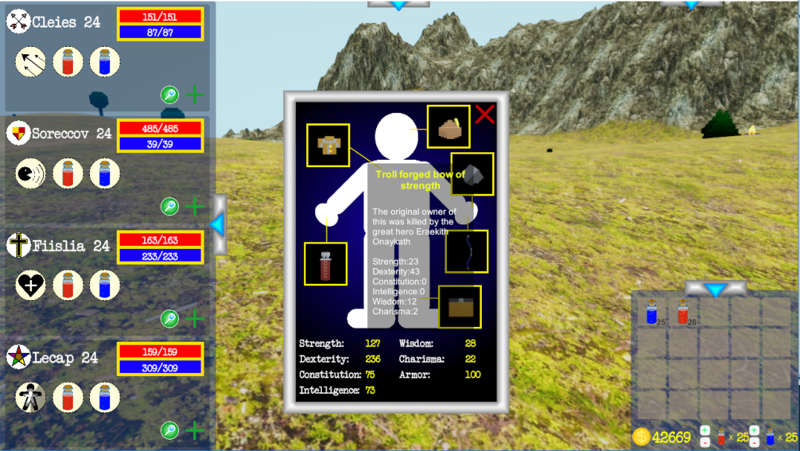 I just have to create and setup the UI elements to interact with the system. So that should be ready to go by next week. It's Ludum Dare weekend so I've been working on a quick competition game for that which made this post a little later than normal. So my apologies for the delay. I'll be back next week with details of the completed save system as well as information on what news things I've been working on. See you then! Happy weekend everybody! I've got some updates this week I'm quite happy to share. It's been a hectic development week and this update is late already so without further delay, let's get started. First on the list is that the save/load system is currently in place and completely operational. Now that we can load saved adventures we're no longer limited by how long we leave the application open. An interface to load/delete saves is available from the titlescreen while a similar interface is available in game to create new saves, overwrite saves and delete them if neccesary. The system also includes an autosave feature for people like myself who don't save as often as they should. The autosave feature can be toggled on/off in the escape menu. On a similar note, your preferences for options set in the escape menu will be saved whenever changed and loaded everytime you start the game. Second on the list is a brand new smart cam! Now whenever you don't select an individual party member to follow, the camera will automagically provide you with an ideal view of the action. This functionality has provided a nice boost in the cinematic experience of playing. Lastly, we are getting seriously close to releasing! That means it's around the right time for beta testers. If you're interested in providing feedback and helping me release a bugfree game, send me a private message with your target platform and I'll get back to you(Quests unlimited will be launching on windows/linux/osx). Greetings and welcome back everyone. Last week's update was pretty substantial but we're just going to have to do our best to top it. So let's get down to business. The biggest change this week would have to be the activity log window. At the top of the screen there's now a UI window that prints out everything that happens on our adventures. These messages are also saved (up to a certain threshold) and loaded along with game saves to refresh your memory as to what the party has been up to. The next few I believe go a long way towards giving the game a much more authentic RPG feel. First off, our party members now have randomly generated names on load. At first I gave them normal names like Heather, John, Jaime, etc, but it just didn't have the same feel as the hard to pronounce names that are generated properly. Equipment items also have a bit more RPG flavor happening as well. Now each item has some original randomly generated description text telling us about the item or it's crafter or perhaps a hero who once wielded it.The item names have also been modified to be more original. Also new, your party members are no longer set in stone. Which classes are contained in your party is now randomly determined at the start of a new game. These classes are of course saved properly and will load the same classes that you saved with. This new features allows you the chance to try different party formations and find what makes the most sense to you. Because of this new feature I decided to add class emblems to the party management window. You will now be able to tell at a glance what class each member of your party is. I've also reworked the aesthetics of healthbars a bit. The player party's health bars are now a different color than those of enemies. This is to help differentiate between the two in the thick of battle. They are also no longer translucent. This is another measure taken to increase readability. The sizes have also been slightly altered. Each has been slightly shrunk down to help reduce screen clutter. This last update is a bit minor but it's something that's been bothering me for a while so I thought I'd bring it up. Do you all recall the cave model that the orcs and bomber goblins have been spawning inside? It looks like a super low poly upside down bowl, it's just sooooo ugly. Well, it's gone. I finally took the time (a lot more time than I'd like to admit) to sculpt a more proper cave in blender. So that's now taking the place of the previous hideous asset and the world is so much better for it. Well that about wraps it up for this week's updates. Next week you can look forward to reading about the introduction of some silly junk loot drops and perhaps the release of the game. It depends on much polishing I can get done. Until then, I wish you all the best and look forward to updating everyone next weekend. This does not mean that development is complete however! I'll still be working on updates to give the game the polishing it needs. I hope you all take the opportunity to give the game a try. Hello everyone. I have family visiting shortly which will mean a short recess from development over the holidays. This being the case, I wanted to push out my latest update before I got too embroiled in everything. So let's get to it!. The most obvious change would probably be the ones made to the UI menus in game. Many were made smaller while all active menus visible during gameplay have been made translucent. I believe this has helped tremendously with the feeling of being claustrophobic while having the windows open. I'm still not done with UI's but I thought this was a worthwhile quality of life update to push out before the break. 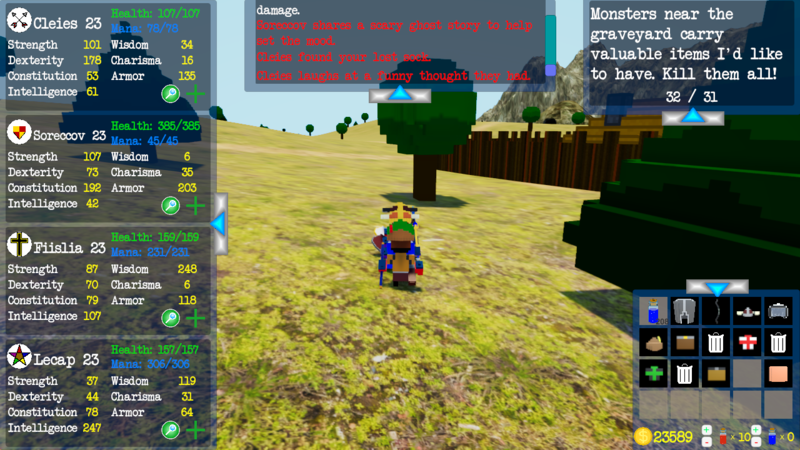 I've also implemented a custom font to add some personality to the game. I think it's a nice improvement over the default unity font. The next update on the docket is level-up effects. Previously you had to be really paying attention to catch a level-up happening. Now the level-up process will be easily identified by the fireworks particle effects over a character as well as a sound effect. On the topic of sound effects, I've added a few to help accentuate certain events that take place in game. Party members will now also play an appropriate sound on death. No more silently passing without so much as a wimper! There's is also a new sound effect that plays when the party is teleported to a campfire on party wipes. That wraps it up for this week. I'm fairly certain that I've forgotten some things but that'll just make the next update seem that much more impressive! The latest builds will be uploaded to the itch store as soon as I hit the post button. There's no errors with loading saves from a previous build, so it's safe to load one up and continue your adventures. Thank you all for reading and I hope you'll join me for the next update. Stay questing! Edit: The latest update seems to have introduced a bug where you can't close the equipment upgrade window. This should be a quick fix and I'll upload the new builds tomorrow. Now fixed, all is well. Welcome back all you happy questers! I realize it's been a few weeks since my last update but I had company stay a few weeks for the holidays followed by me immediately getting sick so I was out of commission for a while. But I'm back now and put in the time this week to make some pretty significant changes, so let's get right to it. One of the issues often brought up is the UI, generally how it can feel a bit intrusive at times. So this week I spent some time moving things around, cleaning up some clutter and I think it's much improved. I'll be showing an updated picture a little further down. In line with UI concerns, some expressed concern about there not being a standard health and mana bar present in the UI to gauge your party's current well-being. So I decided to re-purpose some UI real estate to give the party proper health and mana bars. You may also notice that the huge block of texts depicting party member stats is now missing from the UI panel o the left of the screen. I decided that this information was not important enough to warrant the screen space it was taking up. Member stats can now be viewed in the character information screen accessed by clicking the green plus symbol on each individual party member area on the left UI panel. are now available on the left UI panel. party members will still automatically use their skills similar to before but now they do them on a longer timer. In other words, to be as efficient as possible you'll have to tell them to use their skills and drink potions via these newly implemented buttons because the time saved is substantial. The buttons also have working cooldown indicators to help you easily ascertain which are ready to use. In this most recent build you may now notice that your party members can have different levels. Party members who are dead at the time of an enemy kill will not receive any of the exp from that kill. That means it's all the more important to upgrade your tank's gear to be able to survive encounters. There are currently measures in place to help members who are falling behind but it will still take strategic equipment upgrading to help them make up for lost time. This final change is just a change in the way the potion management system works. Basically, you can now sell potions to the vendor in town. In the inventory window on the bottom right you can specify how many of each potion you'd like your party to have each time they resupply in town. Previously the party would only buy potions to reach the minimum amount of each potion specified by the user. That functionality remains in tact however, now the party will sell it's surplus potions to the vendor for a profit. Before I wrap this up, I just wanted to let everyone know that this game WILL be on Steam in a few weeks. I imagine a nice chunk of time this week will be spent setting up the store page and ensuring all that's going smoothly. Until next time everyone, happy questing!